Players can either join or create their own Guild in order to be part of a community where players can fight together as well as help each other out. Players who want to join a Guild need to do so at a Guild's interface. 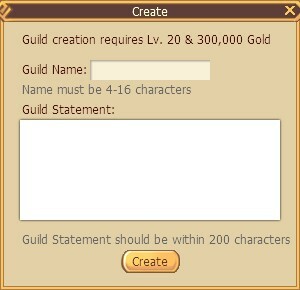 If players wish to create their own Guild they need to be at least level 20 and pay 300,000 gold. Each Guild has different ranks; leader, vice leader, officer and member. Ranks determine how much access players have to the Guild's features. The top 3 ranks have a limit to how many players can be assigned to them. Guilds can also level up via Guild wealth and resources that can be obtained from quests and other means.